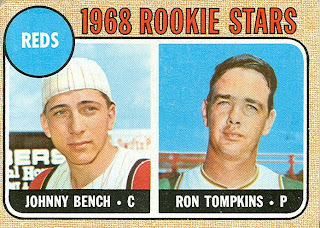 The second-best rookie card of 1968 belongs to Johnny Bench (oh... and Ron Tompkins). 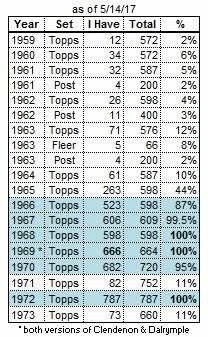 Bench came up in September of 1967, and played well enough that the Reds traded their 6-year starter Johnny Edwards to St. Louis in the off-season. I can remember reading the pre-season predictions in a local Philadelphia paper during the Spring of 1968. 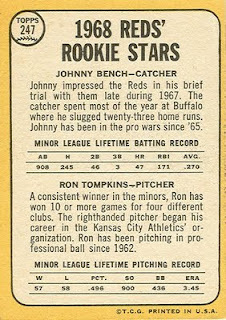 The sportswriter was doing a preview for each team, and for the Reds he said "The Reds need to hope that Johnny Bench can stay off his last name". 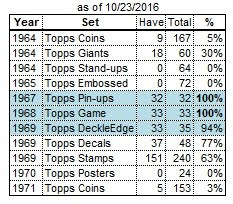 What can be said about Ron Tompkins? Congratulations, you have a very valuable rookie card!